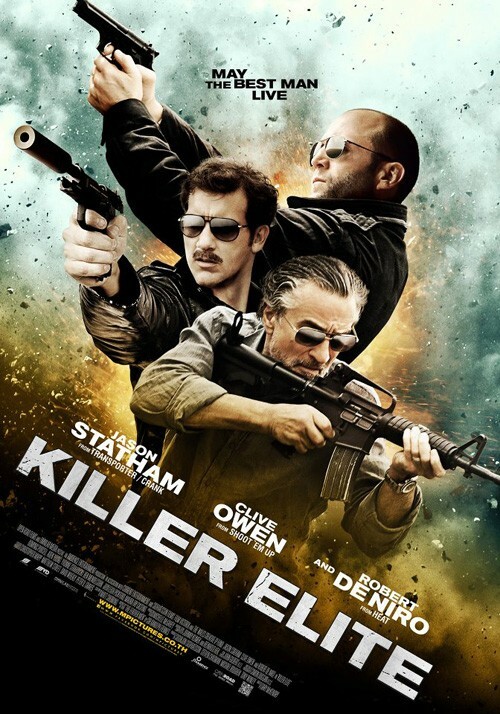 In 1980, hired hitmen Danny Bryce (Jason Statham), Hunter (Robert DeNiro), Davies (Dominic Purcell), and Meier (Aden Young) are in Mexico to assassinate a man. Danny unwittingly kills in front of his young son, then is injured during the getaway. Affected by this outcome, Danny retires and returns to his native Australia. One year later, Danny is summoned to Oman where Hunter is being held captive . He meets with his shadowy contact known only as the Agent (Adewale Akinnuoye-Agbaje), who arranges missions for mercenaries, and learns that Hunter accepted a $6 million job but failed to accomplish it. If Danny doesn't complete Hunter's mission, Hunter will be executed by the Agent's superiors. Danny is introduced to Sheikh Amr, a deposed king of a small region of Oman who wants Danny to kill three former SAS agents; Steven Harris (Lachy Hulme), Steven Craig, and Simon McCann, for killing Amr's three eldest sons during the Dhofar Rebellion. Danny must videotape their confessions and make their deaths look like accidents, and he must do it before the terminally ill Sheikh dies. This will allow the Sheikh's fourth son, Bakhait (Firass Dirani), to regain control of the desert region his father had ruled. If Danny fails, Hunter will be killed by the Agency. Danny reunites with Davies and Meier. They agree to help him in exchange for a share of the money.